Stamping – HKK Machining Co. When it comes to dependability and quality, HKK’s press room has the capabilities to meet your stamping needs. We run progressive dies and offer a vast array of secondary value-added processes, including welding, tapping, deburring, and sourcing plating. We can handle material up to 24 inches wide with a press capacity up to 500 tons. HKK is a Tier-2 supplier of automotive stampings. We produce for the automotive industry as well as other industries such as construction, fluid power, furniture, and food. We are proud to have achieved ISO 9001:2008 Certification and apply our quality standards to every job as required. HKK maintains and builds all our own tooling, providing our customers with the benefits of flexibility, quality control, and speedy delivery. From launch to production, HKK controls the process, maintaining a firm hand on production time lines and delivery dates. This is a key component to our business strategy as well; we are self-reliant in the event of a breakdown. We would set the pace and not someone else. Bottom line is on-time delivery! We build blank dies, form dies, deep draw dies, and heading dies, among others. In addition, we build and maintain outside tooling for other companies. 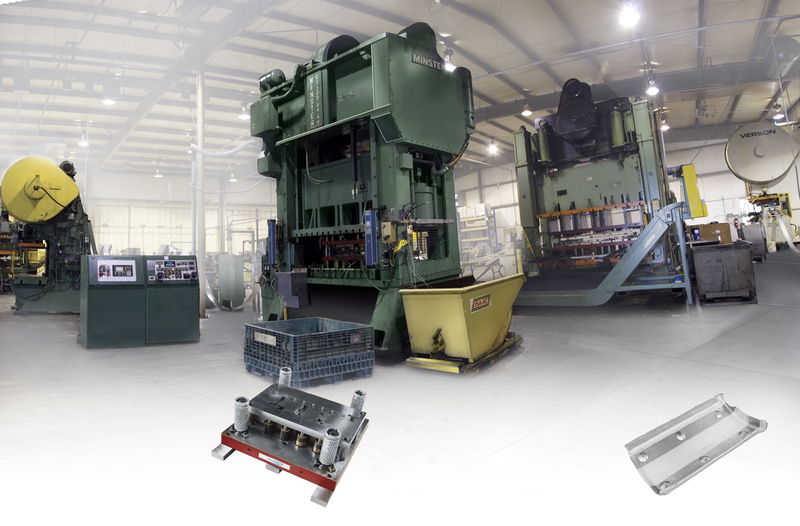 With our capable, adaptable, and experienced in-house die shop, we are ready to consider any challenge our customers provide.